Early detection remains one of the most important ways to reduce the impact of cancer. Yet for many cancers, there remain no accurate tools or tests for detecting the disease before it spreads. Support from the Canary Foundation provides critical resources to explore the most novel approaches for improving our ability to detect and treat cancer at its earliest stage. The Stanford Cancer Institute is delighted to be part of this important effort. The right collaboration and the right partnership change everything. Recognizing early on that we couldn’t do it all alone, we’ve always cultivated strong relationships with institutions, academia, and industry to bring together a diverse set of stakeholders to take on early cancer detection research. Our foundation partnerships link mutual scientific expertise and entrepreneurial spirit in the hopes of advancing research in the diagnostic arena of early cancer detection. Together, we’re creating a world where cancer is diagnosed at its earliest stage to save lives. BIDMC is a site for the Canary Prostate cancer Active Surveillance Study (PASS). PASS is a multi-center study enrolling men with early-stage prostate cancer who elect to manage their cancer by being actively monitored rather than immediately treated. Canary is supporting research for prostate and lung teams. Canary Foundation and BCCA are also managing a resource of antibodies and hybridomas that were created by the Canary Foundation in Victoria to test candidate biomarkers for lung, pancreatic, prostate, and ovarian cancer. In the past, BCCA has supported the Canary Antibody and Assay Production Facility to create reagents to test biomarker candidates. EVMS is a site for the Canary Prostate cancer Active Surveillance Study (PASS). Canary and El Camino Hospital are embarking on a series of clinical trials aimed at biospecimen collection and banking for breast, ovarian, pancreatic, and other cancer types. Canary supports ovary and prostate team research and PASS at FHCRC. For PASS, FHCRC houses the data management and coordinating center and the central biospecimen repository. In the past, Canary has supported the lung, ovarian, prostate, and baseline (to profile baseline biomarker levels in healthy individuals) team awards at this research center. Canary Foundation together with MD Anderson intend to launch a collaborative study that will determine a set of biomarkers for lung cancer to reduce false positive screening, increase lung cancer early detection rate, and identify people with high risk for lung cancer who need screening. The Canary Center at Stanford and the research conducted there falls under the umbrella of the Stanford Cancer Institute (SCI). Early detection is a key component of SCI’s mission of improved diagnostic, treatment and prevention strategies of cancer. Stanford is a site for the Prostate cancer Active Surveillance Study (PASS). Canary also provides support for lung and pancreatic cancer research at Stanford. In the past, Canary has provided support for the lung and ovarian research teams. Canary supports the core resources and Canary Center faculty. Canary provides support for pancreatic cancer research. UCSF is a site for the Canary Prostate cancer Active Surveillance Study (PASS). Canary supports lung cancer research, and in the past supported ovarian cancer research. San Antonio is a site for the Canary Prostate cancer Active Surveillance Study (PASS). UW is a site for the Canary Prostate cancer Active Surveillance Study (PASS), and Canary has provided support at UW for the ovarian and pancreatic cancer teams. Michigan is a site for the Canary Prostate cancer Active Surveillance Study (PASS). The Seattle VA is a site for the Canary Prostate cancer Active Surveillance Study (PASS). Canary supported the City of Hope site for the Novel Markers Trial for ovarian cancer screening. Canary Foundation set up and supported a facility at the Deeley Research Center in Victoria, British Columbia, to generate reagents to test candidate biomarkers for lung, pancreatic, prostate, and ovarian cancer. Canary Foundation and BCCA now work together to manage the antibody and hybridoma resource created over many years as part of this facility. The Early Detection Research Network (EDRN), an initiative of the National Cancer Institute (NCI), brings together dozens of institutions to help accelerate the translation of biomarker information into clinical applications and to evaluate new ways of testing cancer in its earliest stages and for cancer risk. EDRN has provided statistical and data management support for the Canary Prostate Cancer Active Surveillance Study, PASS. Additionally EDRN and Canary Foundation jointly funded a multi-institutional project to discover biomarkers of lung cancer in people who have never smoked. Research continues to gain a better molecular understanding of never-smoker lung cancer and to validate biomarkers discovered as part of the joint project. Canary Foundation worked with Abbott Diagnostics to support testing of blood-based biomarkers in women participating in the Novel Markers Trial. Avaya has provided video conferencing systems to help our global scientists communicate seamlessly and consistently. Avaya has been a major sponsor of the Canary Challenge, our largest annual fundraiser. Canary Foundation researchers worked in partnership with Bracco to enter contrast enhanced ultrasound techniques into U.S. clinical trials. Fujirebio, a premier diagnostics company and an industry leader in biomarker assays, commercialized the biomarker HE4 that was discovered in conjunction with Canary’s Ovarian Cancer team research. HE4 is now cleared in the U.S. as an aid in monitoring recurrence or progressive disease in patients with epithelial ovarian cancer. Genomic Health is well known for their well-regarded breast cancer Oncotype Dx test. The Canary prostate cancer team is partnering with GHI on validation studies of similar tissue-based tests to inform treatment decisions for prostate cancer. This is a gene panel that, if it proves true, will help predict the outcome of the prostate cancer—is it aggressive or indolent? Canary Foundation partnered with GenoLogics to provide software solutions for researchers at different institutions to share multi-omics datasets linked to cell lines, tissues, and blood from the same sets of patients. The Canary Prostate cancer team has partnered with Hologic to test urine-based biomarkers in Canary Prostate Active Surveillance Study participants. Canary Foundation, through the Canary Center at Stanford, is partnering with Labcyte on techniques to improve detection of cancer-related proteins. Labkey uses an open-source approach to help translational research teams make sense of complex data while collaborating securely. Canary partnered with Labkey to provide a standardized data repository for early cancer detection data. The Canary Prostate cancer team is partnering with OPKO Health to test blood-based biomarkers in the Canary Prostate Active Surveillance Study participants. Orchard Supply Hardware chose Canary Foundation as their charity for their annual golf tournament. Over a four-year period, OSH raised $1.3 million for early cancer detection research. Canary Foundation established a partnership with the Lustgarten Foundation for Pancreatic Cancer Research to develop a joint set of blood-based biomarkers for research and early detection testing. Work to generate tests for 60 pancreatic cancer biomarkers was completed in 2010. 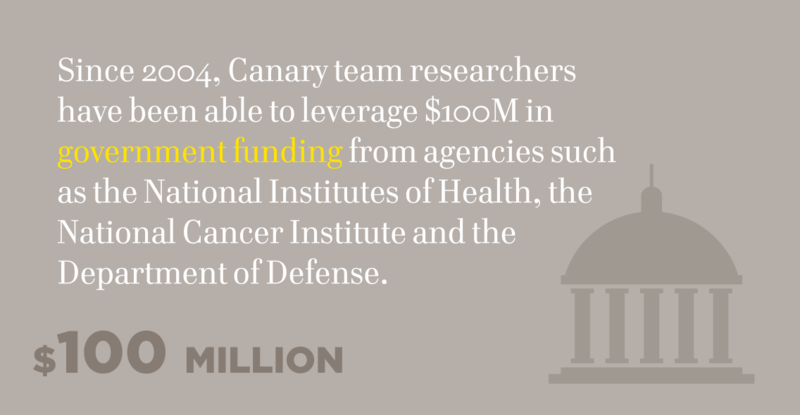 In 2005, Canary and the American Cancer Society partnered to provide postdoctoral research fellowships to scientists in the field of early cancer detection. The program continued until 2011. In 2010, Canary partnered with Uniting Against Lung Cancer in an initiative to find biomarkers in people who have never smoked.